Powered by Mayer’s unique reflections on the mythologies of social and linguistic order, Works & Days possesses a rare combination of artfulness, critical acumen, and personality. The end result is a book that is at once formally inventive and disturbingly of our times. Her latest collection, “Works and Days,” which came out this June, is among her very best, colliding daily struggles (menstruation, money) with natural obsessions (blue herons, mushrooms) and big unanswerable questions (Is motherhood virtuous? Whither patriarchy?). All of this is undergirded by a hefty serving of irony… Mayer writes the kind of nonsense that makes sense, and sense that is nonsense: I can’t think of a better centering device in these topsy-turvy times. Works & Days shows a veteran poet as relentless innovator. 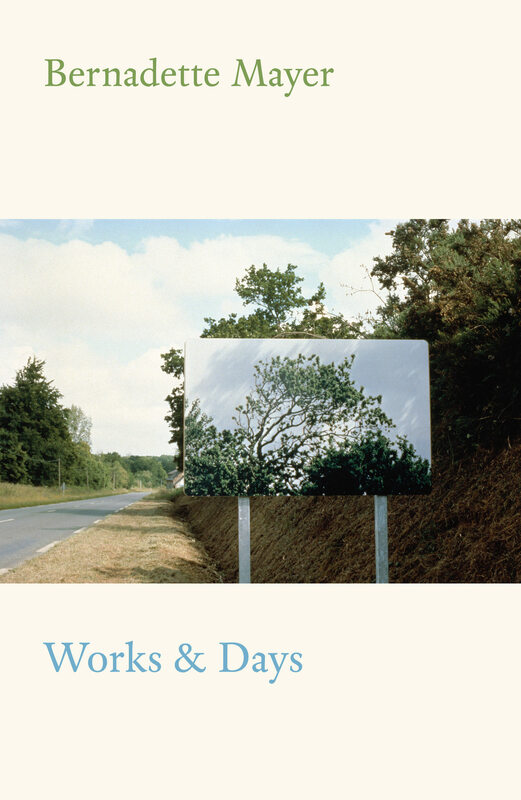 Mayer’s new collection, Works and Days, mixes poems and journal entries, glorying in both the burgeoning of spring and the accidents and irruptions of language. The experience of reading Works and Days is exhilarating; it’s like encountering a new, never-before-seen contemporary artwork you know will stand the test of time…There is no other book from this year I’d more like to read again. Like Hesiod’s famed work from nearly three millennia ago, Mayer’s diaristic book-length poem addresses matters of corruption and injustice, contemplates nature and housekeeping, and dips in and out of mythological imagery. That the collection is written in a freewheeling, humorous and exceedingly casual tone makes the profundity of Mayer’s observations all the more striking. Comprising teensy, often inconsequential moments—like whether it’s rained or has been threatening to rain—these prosaic morsels are gorgeous and serene. Hardly any of Mayer’s days are spectacular, but her eye is so keenly attune to all that surrounds her that nearly everything feels touched with grandeur. One of the most interesting, exciting, and open experimental poets. Mayer’s work is marked with Dorothy Parker’s bite and bawdiness and Gertrude Stein’s inventive discourse. The richness of life & time as they happen to us in tiny explosions all the time are grasped and held up for us to view in her magnificent work.